It began raining last night, and I woke to a damp and drizzly, raw and still-rainy world. But it wasn't very cold, and it wasn't at all windy, so I just waited for a break in the drizzle to go out and give the goats a hearty meal to keep their spirits up. 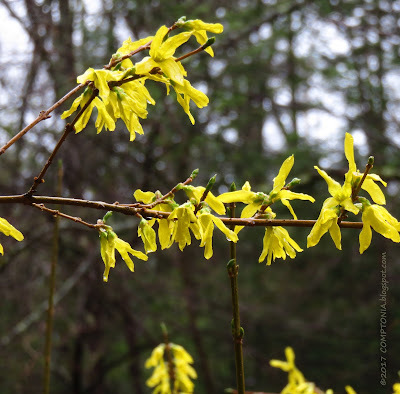 While waiting for the goats to eat, I took a few quick pictures of flowers. Yes, flowers! 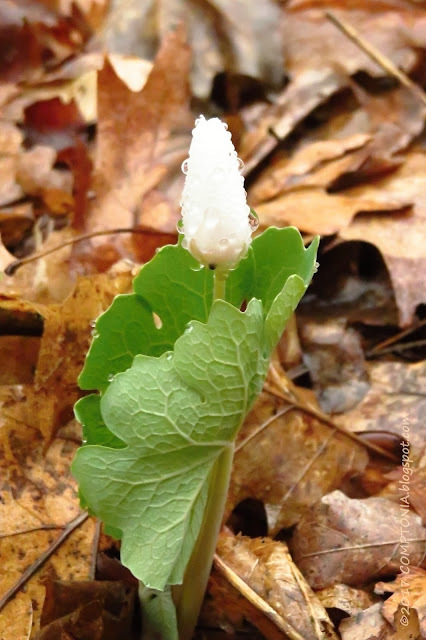 Here is one of the bloodroot plants again. It decided to stay wrapped up and tucked in today, which is exactly how I felt when I woke up and saw the weather. And here is forsythia - or yellow bells, which is what my blogfriend Tipper says they are called in Appalachia. I think of them that way now, too. Perfect name. 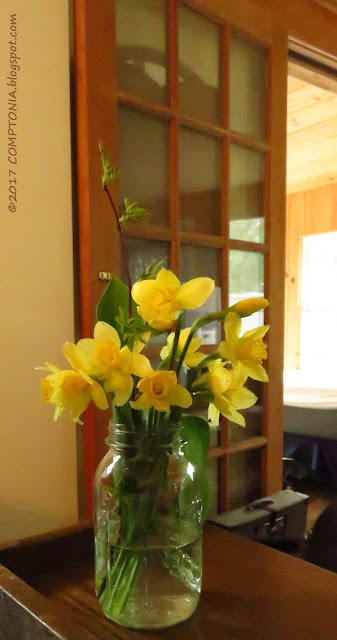 These daffodils got plastered, face-first, to the ground by the rain. They look quite comfortable indoors now, and are the brightest spot in the house. And here are some of the first Vinca blossoms. 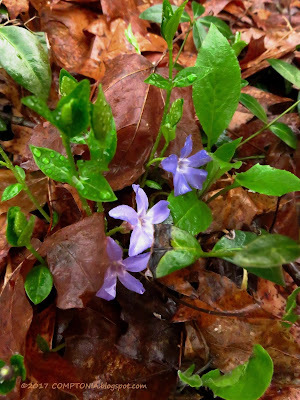 Soon there will be a subtle carpet of vinca flowers. Less subtle if I get out there and rake the leaves off, and maybe I will, but it's not a priority task so no promises there. 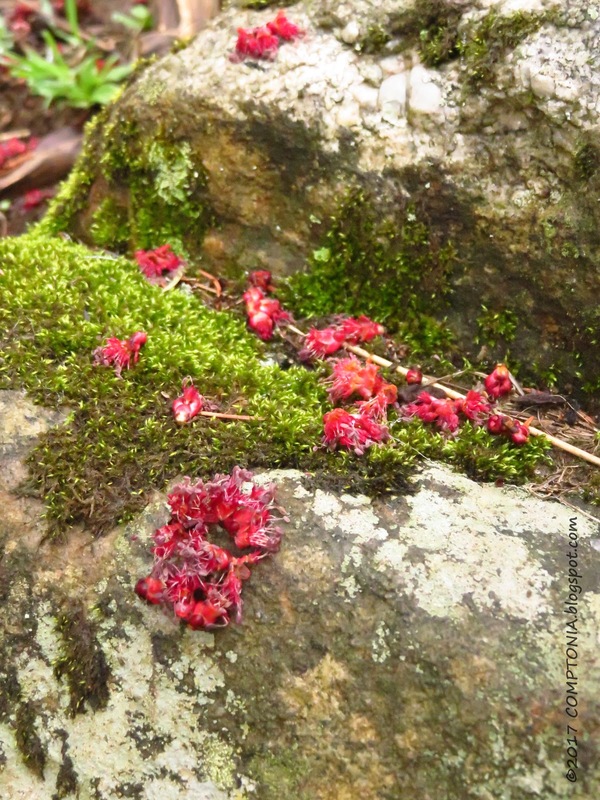 They are red maple flowers. and it is even more apparent on a rainy day. 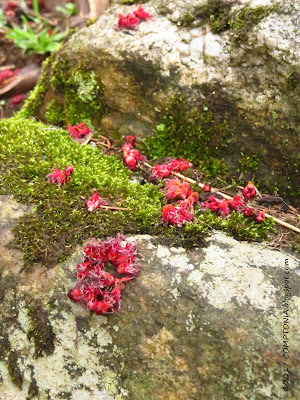 Yesterday - before the rain - I watched Tsuga and Fern carefully eating every maple flower that had fallen on a large rock. I've never seen the goats do that before. Always something new in Goat World! Here's to the start of a great weekend for all.